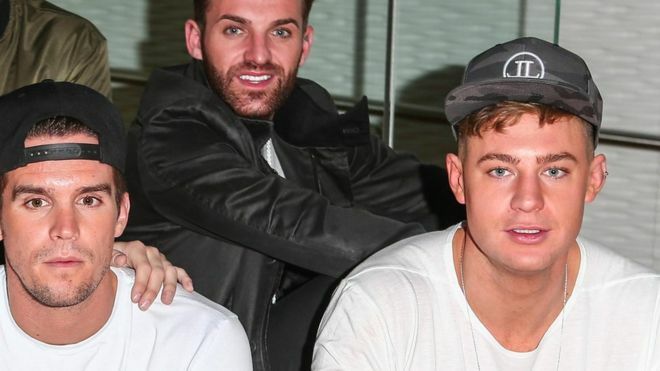 Alamy Three Geordie Shore stars are being investigated by the UK’s advertising watchdog for apparently promoting gambling websites. 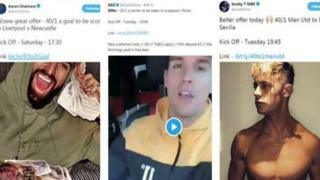 BBC Radio 5 live has discovered that Gary Beadle, Scott Timlin and Aaron Chalmers do not say their social media posts are adverts. The Advertising Standards Authority said this was a potential breach of advertising rules. Beadle, Timlin and Chalmers did not respond to requests for comment. Gary ‘Gaz’ Beadle, ‘Scotty T’ Timlin and Aaron Chalmers have a combined 15.3 million followers across all the various social media platforms. Their posts advertise appealing odds on sports fixtures and encourage followers to link to betting websites Coral and Ladbrokes. New customers sign up to get more free bets, and give their email and bank details to open an online account. Ladbrokes Coral confirmed the men are so-called “affiliates” who are paid commissions if users sign up to a betting account through their social media sites. TWITTER/@AaronCGShore@GazGShore@ScottGShore The stars have posted images on their social media accounts which appear to link to gambling sites Celebrities are allowed to post on social media for companies, but must make clear that it is an advert, and they need to follow strict rules around gambling advertising. The Advertising Standards Authority (ASA) told BBC Radio 5 live it was investigating and would be contacting the advertisers and brands behind the offers that the three have posted about. The ASA also confirmed Beadle had been warned about this type of social media posting before, and had agreed to make adverts clear in future. “We closed the case informally but will not hesitate to take further, more formal, action if the problem persists,” the spokesman added. Marc Etches, chief executive of the charity GambleAware said: “Reality TV stars have extensive social followings. Their fans trust them and are influenced by their views. “Problem gambling and gambling-related harm is a serious public health issue that affects millions of people each year. Stars who care about their fans need to recognise that they too have a responsibility to ensure everyone understands the risks associated with gambling.